The zebrafish has emerged as a premier model for studying cancer progression and metastasis. We have developed a transparent strain of zebrafish, called casper, that allows for unprecedented imaging of how tumor cells interact with cells in the surrounding microenvironment. These cell-cell interactions play fundamental roles in shaping tumor cell behavior. Using a zebrafish model of melanoma, we use state of the art genetic engineering and high-resolution imaging to dissect these interactions. Our goal is to understand the mechanisms that allow tumors to successfully disseminate and take hold in new locations, which is the major cause of cancer mortality. 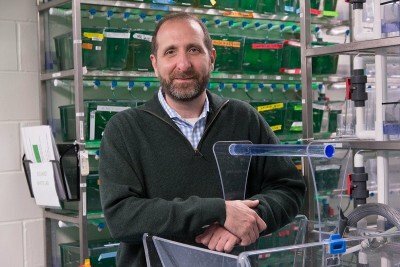 Cancer biologist and oncologist Richard White uses the zebrafish to dissect interactions between tumor cells and the microenvironment that promote metastasis. Albany Medical College: M.D., Ph.D.